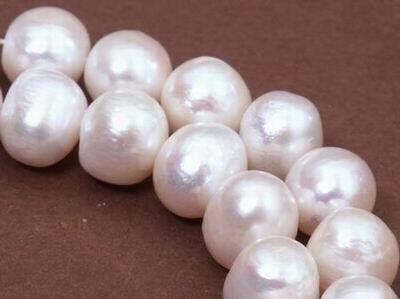 These are our largest pearls with many in the strand 11mm and one or two slight larger. Which is about as big as you get as far as pearls go - unless you spend thousands! Beautiful luster with very little grooving. All natural. Price is for per 15-inch strand. China has the resources that Japan lacks: many large lakes, rivers, and a low-cost work force. The first Chinese cultured pearls were basic, until the 1990's when China revolutionized pearling. Shapes, luster, and colors of the new Chinese pearls now surpass Biwa quality.